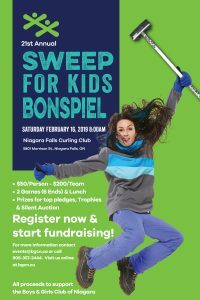 DoJoin us for our 21st Annual Sweep for Kids Bonspiel charity fundraiser on Saturday, February 16th 2019. The event will see 20, 4-person teams from beginners on up, participate in a curling competition with all proceeds in support of the Boys & Girls Club of Niagara. Register in person at the Boys & Girls Club in Niagara Falls. Register by phone during business hours by calling 905-357-2444.